Who hasn't had the urge to go WILD sometimes? I knew this book was destined for my book shelf when I saw the beautifully illustrated cover. Mr. Tiger's fun expression begs the reader to find out how this properly dressed tiger is going to go wild. Mr. Tiger lives in a very proper town, where they dress in very proper clothes, walk on two proper legs and lead very proper and boring lives. 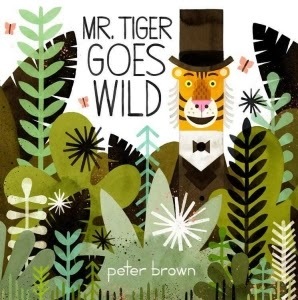 So Mr. Tiger, who was "bored with always being so proper" got a "very wild idea." Starting with getting on "all fours", Mr. Tiger starts casting off his proper constraints and gets WILD! And he ROARS! The town folk are not too happy with Mr. Tiger and tell him to kindly act wild in the wilderness. Mr. Tiger says "What a magnificent idea!" Although he has lots of fun being wild and free, Mr. Tiger soon misses his friends, and the city. He returns to find a surprise!